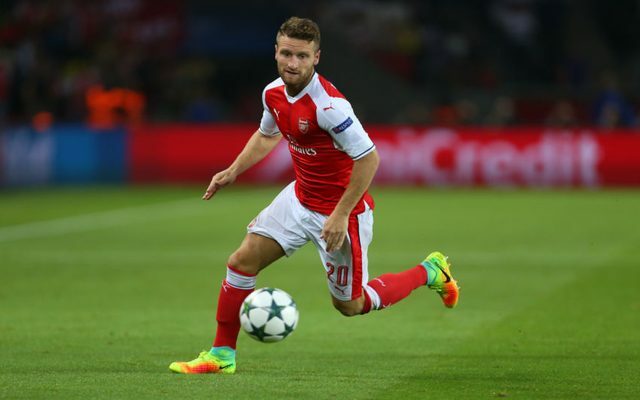 Inter Milan are said to be eyeing up a £35M move for Arsenal and Germany star Shkodran Mustafi, after reports emerged that the defender has failed to bond with his Gunners team-mates, according to the Daily Star. The Daily Star are reporting that the north London club could be willing to sell Mustafi, 25, if the 2010 Champions League winners offer £35M for the centre-back, which is the same amount the Gunners paid Valencia last summer for the player, with Arsene Wenger’s side having already rejected a loan offer for the Germany international last week. Mustafi, as per the Daily Star, was a first team regular for Arsenal last season, however despite his presence in the Gunners’ starting line-up, the former Valencia man has failed to bond with his team-mates, which has opened up a move for the player. However any deal for Mustafi will rely on the Gunners have a replacement for the German lined-up beforehand, as the club have been left short at the back after Brazilian Gabriel completed his move to Valencia at the end of last week, report the Daily Star. Should Arsenal end-up selling Mustafi, it’ll certainly be interesting to see who the north London side decide to go for as a replacement for the World Cup winning star.